At least 49 people have been killed and over 100 wounded in a series of bomb blasts in the capital Baghdad and the city of Hilla in central Iraq, police and medics said. Several explosions rocked mainly Shiite districts in Baghdad on Tuesday killing 14 people. The deadliest attack took place in the district of Bayaa, when a bomb inside a parked vehicle exploded near a bus station, killing five and wounding 24, Reuters said citing sources. Explosions also hit the Amil, Ilam and Shurta districts. Further 35 people were killed and 90 more were injured in central Iraq, when three car bombs went off in different locations in the city of Hilla and four more in nearby towns, located 100 km south of Baghdad. 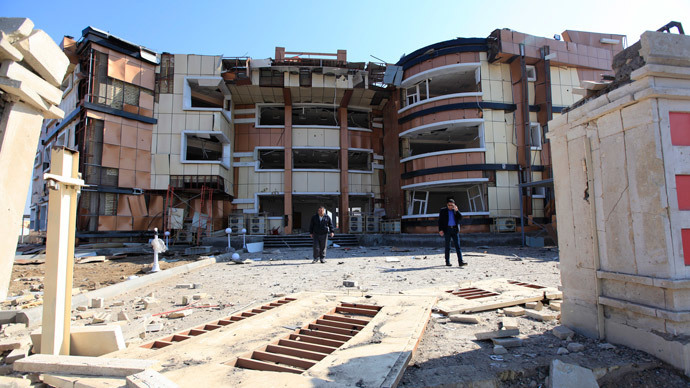 "Hilla hospital has received 35 bodies so far from seven car bomb blasts," said one health official. "I was sitting in my shop when suddenly a powerful blast smashed the front window," said Ali Mousa, the owner of a market in central Hilla as quoted by Reuters. "I went out to see what happened and saw bodies on the ground and wounded people bleeding and shouting for help." No group has yet taken the responsibility for the attacks. Hilla police chief blamed groups linked to al Qaeda. "Al Qaeda terrorist groups stand behind today's attacks in Hilla to confuse the security forces and cause high casualties among civilians," said Major General Abbas Abid. "They are criminals and they never get enough of innocent blood". Shiites are often targeted by Sunni Muslim militants in Iraq. On Monday at least 24 people were killed in similar explosions in Baghdad. Several bombs went off near two Shiite Muslim mosques and at a busy bus station. The Iraqi army was fighting Sunni militants in the town of Sulaiman Pek on Monday. The insurgents took over parts of the northern town on Thursday raising the flag of the Islamic state in Iraq and the Levant (ISIL), the Al-Qaeda branch in Iraq and war-torn Syria. Violence in Iraq has been on the rise over the past year, with almost 9,000 people killed in 2013 which became the bloodiest year for Iraq since 2008, according to UN estimates.